While You’re Searching for the “Must Have” Gift . . .Have You Considered Nutmeg? Nutmeg is the spice of the holiday season. We taste it in our spinach, sprinkle it on top of our eggnog, and its unique aroma fills the house when we use it in our baked goods. 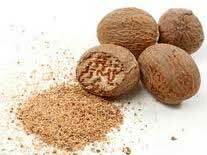 Nutmeg was actually considered a feel-good medicine (potent enough to induce hallucinations) long before it was a cooking favor. The demand for nutmeg was so high that culinary historian Michael Krondl named nutmeg the “iPhone of the 1600’s.” During the craze to aquire nutmeg, the Dutch and the English were fighting for control of the spice trade. It ultimately led to a treaty where the Dutch traded Manhattan for the small island of Run (in the Banda Islands) to control the nutmeg trade. The fighting over nutmeg didn’t end in the 1600’s. We’ve just hit the anniversary of another nutmeg battle. This one was a legal dispute involving ediblenutmeg.com. On December 8, 2011, the National Arbitration Forum ruled Edible Nutmeg a/k/a Edible Communities had the rights to similar domain names, partially because of its rights to EdibleNutmeg.com. Your domain name is just your website address. For instance, my law firm’s domain name is www.dodgelegal.com, but my firm has multiple domain names; including www.dodgelegalgroup.com. While domain names have the technical function of getting us where we want to go on the Internet and to our email addresses, domain names also have an important function in our business world because they’re closely related to our products or services. Another company registered the domain: EdibleOmaha.com. Edible Nutmeg argued EdibleOmaha.com was confusingly similar to Edible, because it merely adds a geographic term with the same tld (.com). Edible Nutmeg also demonstrated the competitor had no legitimate right to claim Edible Omaha and it was using the website to trick consumers to visiting its website ultimately to advertise good and products competing with Edible Nutmeg in bad faith. Edible Nutmeg won and EdibleOmaha.com was transferred as an award. While the battles over nutmeg go back centuries, this type of domain name dispute is a relatively new area of the law. Want to know more? Dodge Legal Group, PC offers a Domain Name Audit and Review for a flat fee. Contact us for more information.